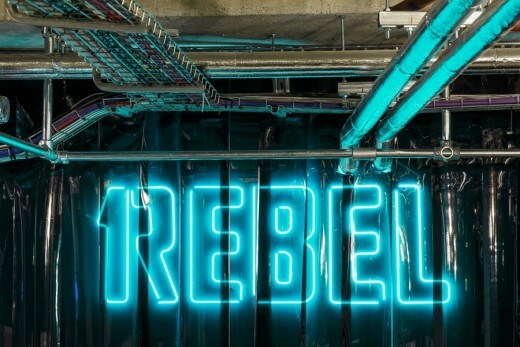 Studio C102 has just completed the fit-out of the latest 1Rebel, a 8500sqft luxury gym located in the newly redeveloped Broadgate Circle, London. 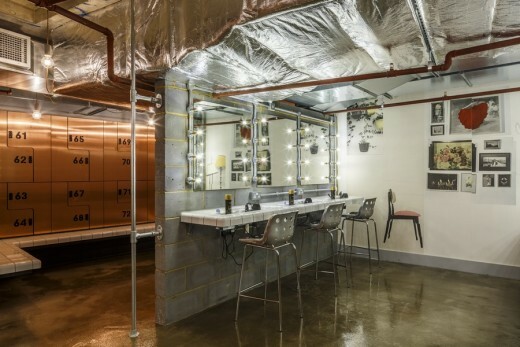 As part of British Land’s extensive redevelopment of Broadgate, Studio C102 has transformed the previous plant-room and storage space into a contemporary, industrial space which is balanced in luxury and chic club glamour. 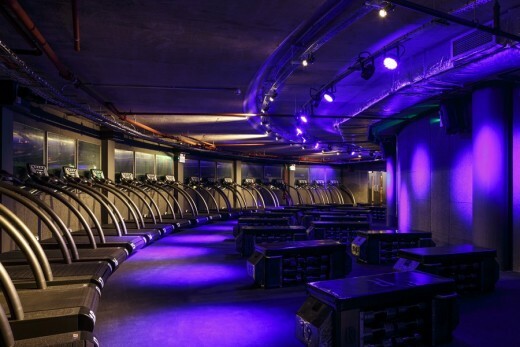 Situated in the basement underneath the circular open-air square, Studio C102 was inspired by the underground location to create a gym with a darker and moodier atmosphere than at the first 1Rebel in St. Mary’s Axe, London, which opened earlier this year. 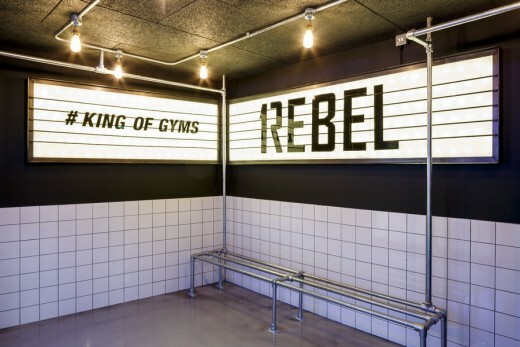 The entrance to the gym stands at street level, and the first thing visitors encounter is a cinema themed sign which wraps around the inner wall. 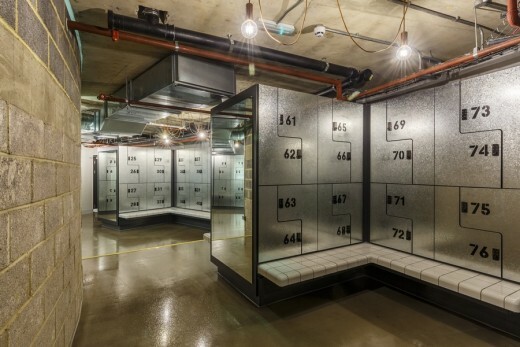 Gym-goers are then met by mesh panels and walls covered in dark-green welding curtains. 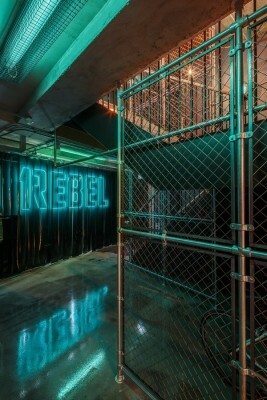 1Rebel neon logos have been placed behind the welding curtains, and combined with some green filters to the existing fluorescent lighting, gives the entrance area a unique green ‘clubby’ glow which sets the scene for the rest of the underground space. 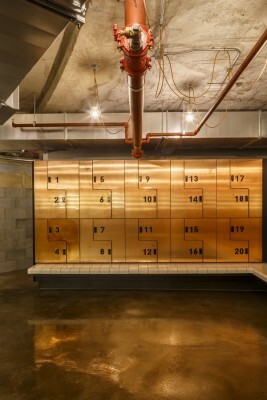 The reception area and retail zone is lit by industrial light fittings which add a distinct moody atmosphere whilst complimenting the overall gym design. 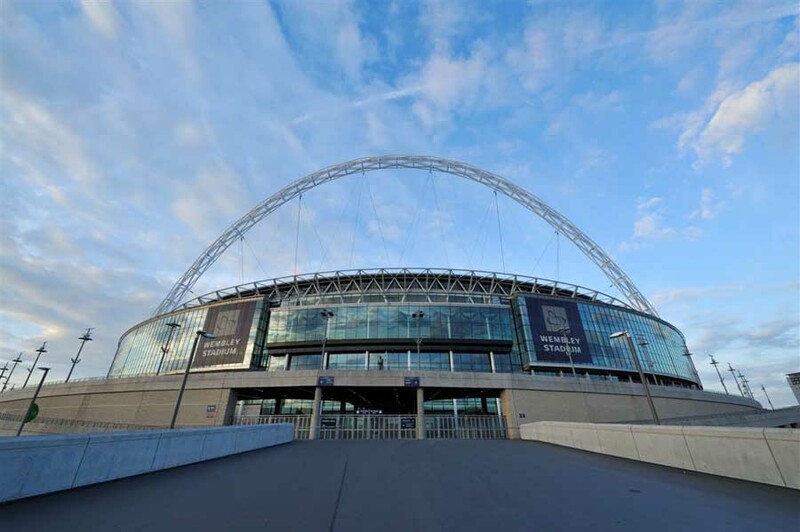 A key design feature is the bespoke Kee-Klamp rail which snakes its way through the space, adapted for different uses as it moves zones. 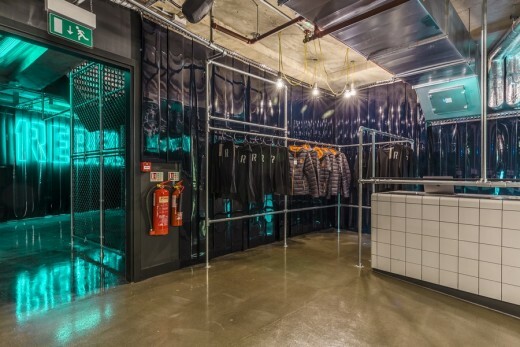 It starts off as an iPad rail which shows images and videos to passers-by through the shopfront before becoming a bench, then it turns into balustrading and a clothes rail for 1Rebel’s own luxury sportswear, before climbing over the reception counter and finally turning into more benches. The floors’ uneven and velvety texture has been created by pouring the concrete on different days, and is in keeping with the studio’s design ethos of ‘using modest materials in novel ways’. In contrast the reception desk is made from white handcrafted tiles which create a stylish smooth curve to all the desk’s edges. 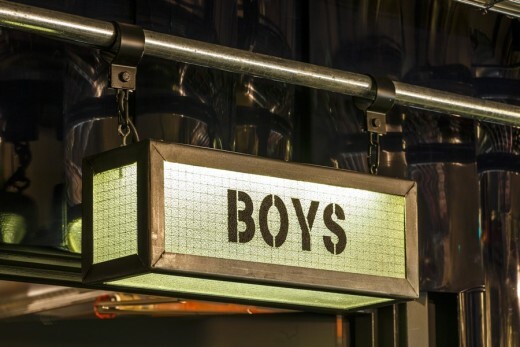 A small pop-up bar with contrasting black tiles is situated in the middle of the reception area and provides welcome refreshments for the gym’s guests. 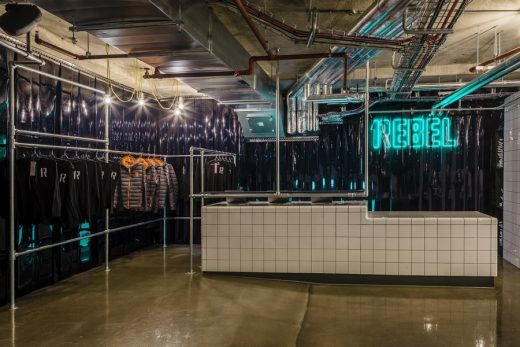 To continue the industrial club theme, 1Rebel’s two studio spaces have been designed as black boxes, entirely covered in black timber fibre acoustic insulation panels and recycled black rubber floors. 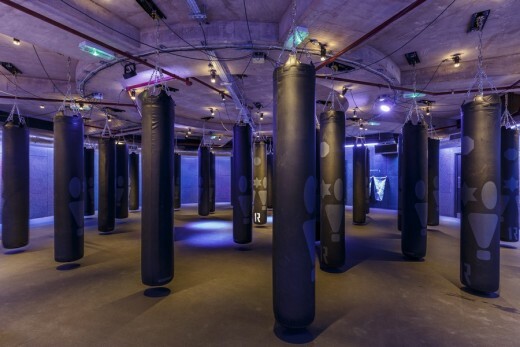 In the ‘Rumble’ studio, the architects accentuated the circular space which sits directly under the Broadgate circle through the placement of the custom made boxing bags and theatrical lighting, creating a unique space for 1Rebel’s HIIT sessions. 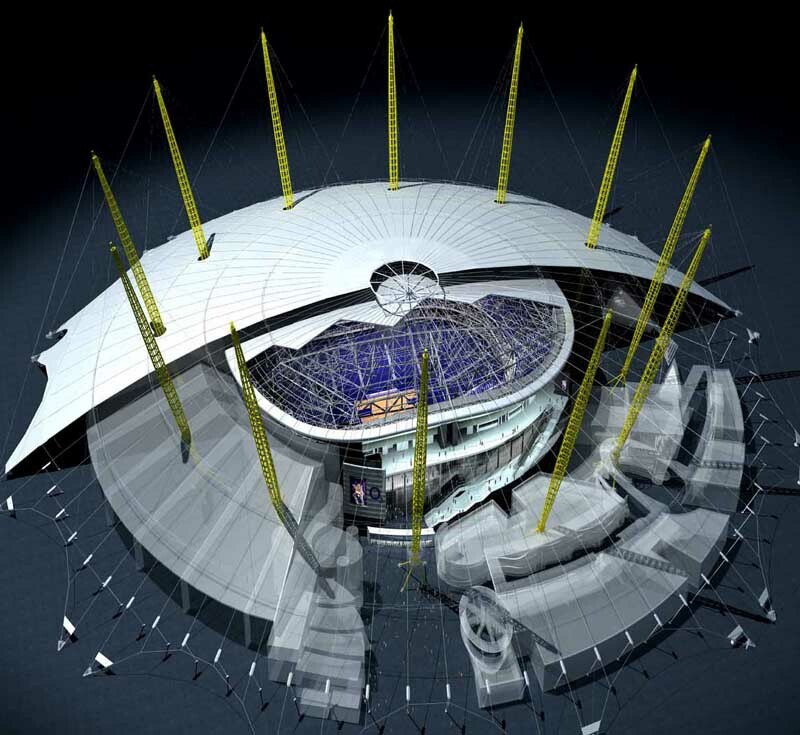 The ‘Reshape’ studio curves along the side of the circle and features Georgian wired mirrors with steel frames and 1Rebel bespoke benches which contain weights, eliminating the need to pause during workout sessions. 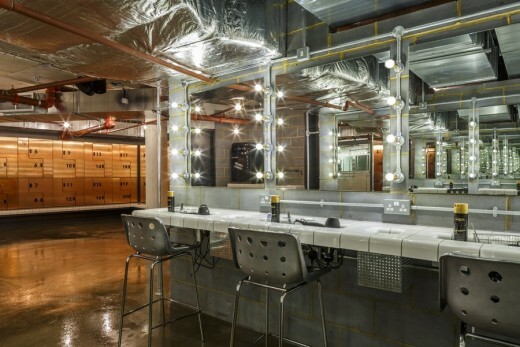 The spacious changing rooms echo the same industrial feel with the use of handmade tiles, Hollywood style mirrors, SMEG fridges with chilled towels and galvanised steel lockers. 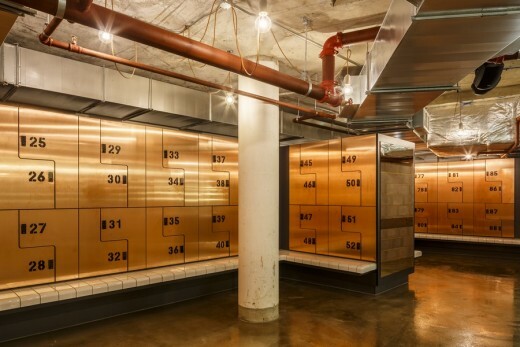 The women’s changing rooms are softer with wallpaper and copper panelled lockers. 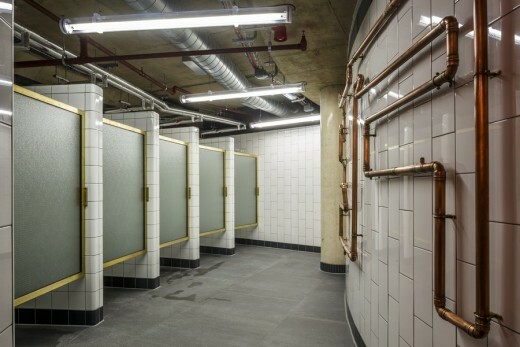 New to the Broadgate 1Rebel are rain shower cubicles formed from bespoke brass-framed Georgian wired glass doors and which contain powerful rain shower heads. 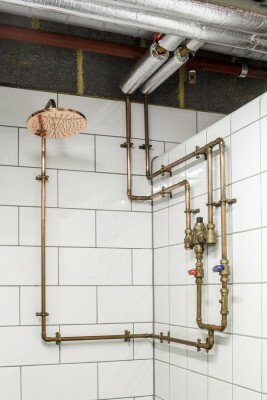 Opposite, the cubicles’ exposed copper pipes are used to heat the towels.